"You probably know that the first instance of Greek language on an object was found in the Greek ruins in Ischia." There were, however, no monkeys. The pith- comes in because Greek mythology spoke of a race of thieving and mischievous little forest creatures called Cercopes that Zeus turned into monkeys and banished to various volcanic areas, one of which was our island out here in the bay. (I'm hazy on that. Cercopes means "-with a tail" in Greek and there is, indeed, a genus of monkey called cercopithecus; thus, I don't know if these little Greek proto-Leprechauns had tails before or after Zeus turned them into monkeys. Robert Graves in The Greek Myths (1955), section 136.c-d has "...[some say that Zeus] punished their fraudulence by changing them into apes with long yellow hair, and sending them to the Italian islands named Pithecusae." ["Islands" —plural—because the small island of Procida, next to Ischia, was included.] So, apparently, the settlers did not name the island when they settled. It was already Pithechusa and they had set out from Greece—Euboea, the second largest of the Greek islands—where things must have been dull, indeed, to sail to that volcanic island in Italy where Zeus had sent all the ape-men. 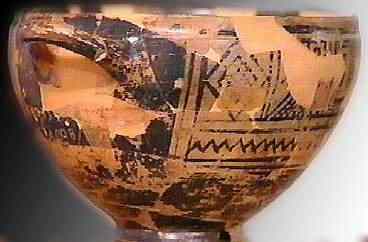 Nestor's cup and early Greek writing. The Archaeological Museum of Pithecusa, open since 1999, is housed in the 18th-century Villa Arbusto in Lacco Ameno on Ischia. The jewel of the collection is "Nestor's cup" (top photo). That expression can be (1) a reference to Homer's Iliad and the golden cup belonging to Nestor, the wise, old advice-giver and king of Pylos; (2) a cup discovered at Mycenae by Heinrich Schliemann (the excavator of Troy) that he claimed was the Nestor's Cup of the Iliad; or (3) the cup on display at the museum on Ischia. The Pithecusa cup bears an inscription in an early Euboean form of the Greek alphabet. This forerunner of our modern alphabet was in existence in Greece by about 800 b.c., and there are enough samples from 700- 600 b.c. to show that writing was widespread enough in the Aegean by then to serve as a practical means of communication, for commerce and even early literature. "This is Nestor's cup, good to drink from. Whoever empties it will be seized by desire for Aphrodite, crowned with beauty." It is generally agreed upon that the inscription was meant to be humorous —a piece of clay claiming to be the fabled golden cup, indeed! (Ho-ho. Slap my thigh and call me Ajax.) Other than that, the jury is out and probably never coming back. It may be a classical reference to the Iliad (given the ample wiggle room on the presumptive date of the writing of that classic); on the other hand, whoever inscribed the cup may have known about Nestor from other sources (after all, Homer had to get it from somewhere). It is also slightly racy —"seized by desire"— so maybe the inscription was the result of a "drinking game", slightly tipsy potters in ancient Greece each inscribing a line. The Pithecusa cup was not manufactured on Ischia; it was made in Greece and brought to Italy by settlers. *from "Observations on the 'Nestor's Cup' Inscription" by Calvert Watkins, in Harvard Studies in Classical Philology, Vol. 80 (1976), pp. 25-40. The earliest inscriptions in the Phoenician alphabet appear around 1050 BC. But that date is not really so old if you think that the ancient Chinese and Sumerians were writing in some fashion as long ago as 3000 BC. That's why we differentiate between "early alphabet" and "early form of writing". All those alphabets come from earlier forms of writing that are conceptually different from an alphabet; that is, they are some kind of "picture" writing. Sumerian cuneiform wedge writing (shown, right) from around 3000 BC was an example. Those systems can be quite complicated, as were Egyptian hieroglyphics, and it does not follow that they must change and develop into alphabets. Chinese has not changed (although it has often simplified the characters). But they can change and historically have usually done so. The Phoenician alphabets descends from Egyptian hieroglyphics. There was yet another form of writing, a syllabary, used by the Minoan civilization first on the island of Crete around 2000 BC and then in Greece, itself, after the Minoan culture was destroyed (according to one theory) by the eruption of Santorini island (called Thira in modern Greek, the Italian name Santorini --from St. Irene-- was tacked on by the Venetians) 200 km/120 mi SE of the Greek mainland around 1700 BC and everyone picked up and moved to the Greek islands and then the mainland further north and became Mycenean Greeks. There were really two writing systems. One was called Linear A and the other Linear B. The second one, Linear B (shown, right), has been partially deciphered. It is a syllabary; that is, a symbol represents one syllable, like writing the word hello with two symbols. Linear B consisted of 87 signs, each representing one syllable, and the Mycenaeans appear to have used Linear B to record economic matters of interest to the elite rulers but of little interest to their subjects. There doesn't appear to have been poetry or epic literature, at least that we know of. That is a bit of a mystery. Ancient civilizations could indeed produce literature if they wanted, no matter what system they used. There is nothing inferior about the wedge-shaped Akkadian cuneiform writing used to write the Epic of Gilgamesh in 2500 BC. The Myceneans just didn't do it (again, that we know of). Linear B also contains ideograms, pictures with self-evident meaning. (A picture of a dog with an X over it for "no dogs allowed" is such a logogram in the modern world.) The other system, Linear A, has still not been deciphered, so we don't know what it is. An alphabet? - unlikely; syllabary? - maybe, but it's not even certain if it represents the same language as Linear B. Why would they have two? It's also possible that Linear A is related to the older hieroglyphic system used by the ancient Egyptians. Mycenaean Greece (named for the most important city, Mycenae, about 100 km/ 60 miles SW of Athens), along with the entire Eastern Mediterranean went totally to pieces after 1100 BC. (Technically, that chain of disasters, wars and other niceties is called the Bronze Age Collapse. It lasted for three or four hundred years.) Then the Greeks came back, started forming city states and thinking about writing histories, mythology, astronomy, geography, philosophy, mathematics and jokes about Nestor's cup. For all that they used a true alphabet. That is the alphabet found on the artifact on Ischia (see item 1, top of this page). The example of Linear B is on display at the National Archaeological Museum of Athens. This is an excerpt from "The Alphabet in Italy" by Rhys Carpenter from The American Journal of Archaeology, Vol. 49, No. 4 (Oct.-Dec., 1945) pp. 452-464. This is from a much longer article, amply illustrated and fully footnoted. Rhys Carpenter (1889 – 1980) was a highly respected classical art historian and professor of Classical Archaeology at Bryn Mawr College. He was also a professor at the American School of Classical Studies in Athens and instrumental in planning American excavations. He argued for dating the Greek alphabet to the eighth century B.C. (i.e. the 700s BC), now consistent with general scholarly opinion. His insight about the importance of pottery in the transmission of literacy to the Etruscans is a valuable one. ...were the first among the Greeks to undertake long voyages; and it was they who disclosed Adria and Etruria and Spain and Tartessos, traveling not in merchant-tubs but in fifty-oared ships. For nearly a century and a half thereafter, Greek-Etruscan trade flourished without recorded interruption or hostility. Then, in 535 B.C., after many of the Phocaeans had abandoned their Asia Minor home through fear of their new Median overlord and migrated to their twenty-year-old colony of Alalia in Corsica, the Greek infiltration close to the Elba mines and the passage between the Tyrrhenian and Ligurian Sea, aggravated by hybris toward the natives, brought an Etruscan-Carthaginian alliance against them with a navy which the Alalians were able to defeat only at cost of their own men-of-war. The Etruscans conveyed their Greek captives from this engagement to their port-of Agylla below Caere and there stoned them to death; while the doubtfully victorious Phocaeans, correctly appraising the situation, withdrew from Corsicato southern Italy with their families and all the possessions which they could load on their few remaining ships, and founded Velia. Thus ended the Phocaean chapter in the Greek exploitation of the West. Etruscan ill-will, once kindled against the Greeks, spread to Cumae outside the Gulf of Naples, now the northernmost outpost of Greek trade in the Tyrrhenian Sea. In 524 the Etruscans of Capua, taking with them Dauni and Aurunci tribesmen, made an unsuccessful assault on Cumae, which in turn proceeded to ally itself with the Latin League to defeat the Etruscans at Aricia and break their hold on Rome. Previously, Cumaean contacts had been more with the interior of Campania and extended across to eastern Italy on the Adriatic. It is not until these events of the last quarter of the sixth century that we are entitled to postulate any very direct or very intimate cultural relations between Greeks and Latins. But Greek trade with Etruria survived these vicissitudes. Continued importation of Attic ware is attested by the contents of the Etruscan tombs; and the strong formative influence of Attic art on Etruscan wall-painting proves how close the contact must have been. The final cessation of relations came with the Persian War and its concomitant Punic-Etruscan alliance against the Greek towns of Sicily, culminating in the crucial naval battle off Cumae in 474 B.C. Thereafter, to its own cultural detriment, the failing Etruscan empire looked north and sought to compensate itself beyond the Apennines, while on the south it wholly abandoned Greece in favor of Carthage which by now completely controlled the Spanish and Atlantic trade. Commercial relations between Etruria and Greece had thus lasted almost precisely two centuries, from ca. 680 to 474 B.C. Early in that span of years the Etruscans had learned the Greek alphabetic signs. Attic influence had come too late to count in this regard. The Phocaeans had arrived early enough; but it was not they who taught the Etruscans their letters. At the start, it was Corinthian pottery which bulked largest in the Etruscan importation of Greek wares (...) Etruscan imitations of Protocorinthian and especially Corinthian are innumerable. Though Greek Protocorinthian almost never carried any written legend, imported Corinthian was copiously adorned with writing. And it is precisely at the turn from Protocorinthian to Corinthian, around the middle of the seventh century, that Etruscan familiarity with alphabetic writing is first attested by the tomb-finds.